Jimmy Kimmel returns to host the 2018 Oscars. For all of our 2018 Oscars, 2018 Oscar Nominations 2018 Oscar Winners news, check back daily. Our 2018 Oscar Ballot goes live February 20, 2018. The 2018 Oscars will be broadcast in the United States live on ABC Sunday, March 4, 2018. And, as usual, we bring you the most coverage of the 2018 Oscars, including all 2018 Oscar nominees and 2018 Oscar winners news. Jimmy Kimmel hosts the 2018 Oscars, his second consecutive year, with Michael De Luca and Jennifer Todd also returning as producers. 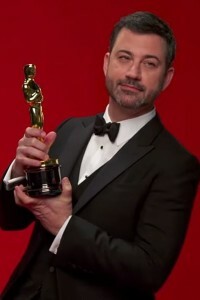 Jimmy Kimmel infamously presided over the 2017 Oscars, where a mix-up backstage led to “La La Land” being mistakenly announced as the best picture winner when the award was really supposed to go to “Moonlight.” Will there be any mistakes during his reign over the 2018 Oscars? Here is the list of all 2017 movies, every movie eligible for 2018 Oscars. Wild About Movies will be at the 2018 Oscars, providing live coverage, in real time. So check back on Sunday, March 4, 2018, beginning at 8PM EST for all of our 2018 Oscars coverage. To say that MTV And Emma Watson Go Off The Deep End is an understatement. MTV has been irrelevant for more than a decade.